By many simply called ‘parmesan cheese’ needs a further explanation. Parmigiano Reggiano, the world famous seasoned cheese is produced in the province of Parma, Reggio Emilia, Modena, Bologna and Mantova. Made of milk of veal., salt and natural rennet. Being such a natural product, no labelling is required. Minimum 12 months of seasoning. Some are season over 30 months. Parmigiano Reggiano is commonly considered as the ‘most prescious’ of the seasoned cheese. Grana Padano; Produced in the area nearby Parma, Piemonte, Lombardia, Emiglia Romagna and Veneto. Made of cow milk. Minimum 9 months seasoning is required. Some caterers think Grana is better in cooking, being slightly softer. 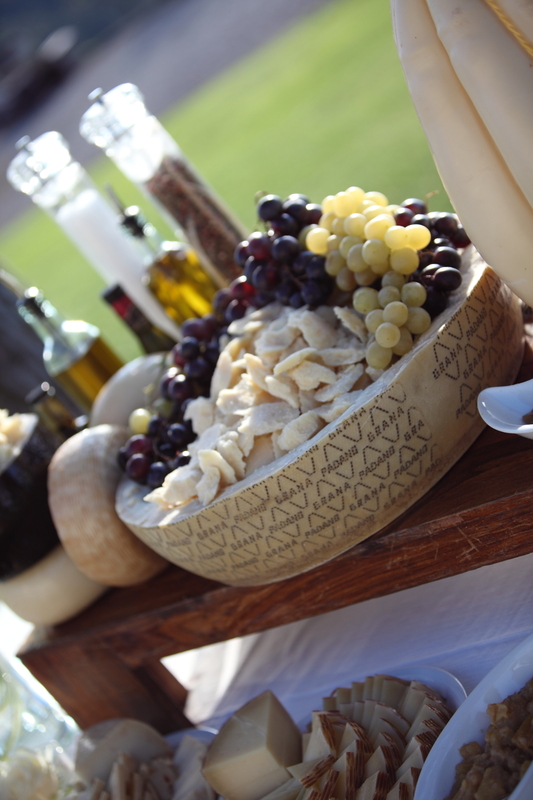 Both are delicious…in Tuscan Wedding Buffet table !